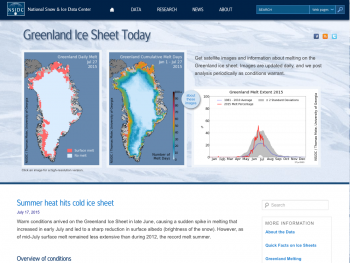 The summer sea ice melt season has ended in the Arctic. 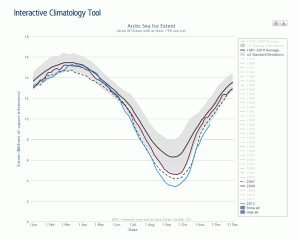 Arctic sea ice extent reached its low for the year, the second lowest in the satellite record, on September 9. The minimum extent was only slightly above 2007, the record low year, even though weather conditions this year were not as conducive to ice loss as in 2007. Both the Northwest Passage and the Northern Sea Route were open for a period during September. For additional numbers for previous years, see Table 1. While the melt season in 2011 got off to a slow start, the ice loss pace quickened during June. Ice retreated quite rapidly in the Kara and Barents seas, with rates more than double the average rate. Rapid ice loss continued during the first half of July but then slowed considerably as a series of low pressure systems moved over the central Arctic Ocean. By the end of July, ice extent was slightly above that seen in 2007. Ice extent stayed above 2007 for the remainder of the melt season, reaching its minimum of 4.33 million square kilometers (1.67 million square miles) on September 9, 2011. Since the minimum, a rapid freeze-up has begun. On October 1, the five-day average extent rose above 5 million square kilometers (1.93 million square miles). In 2007, a persistent dipole anomaly weather pattern, with unusually high pressure over the Beaufort Sea and unusually low pressure over the Kara Sea, helped contribute to the record ice loss. This pattern resulted in strong southerly winds from the Bering Strait region across the North Pole, which brought warmer winds and ocean waters northward to melt the ice edge and push the ice northward. In addition, especially strong high pressure over the Beaufort and Chukchi Seas in June 2007 resulted in less than average cloudiness, allowing more sunlight to reach the ice. The Arctic saw a similar weather pattern this summer, but not as strong and persistent as in 2007. The location of the high and low pressure centers was also shifted, so that the winds blew east to west instead of toward the north as in 2007. This shift is reflected in the movement of the sea ice, particularly during August. Patterns of air temperatures (measured at the 925 millibar level or about 1,000 meters or 3,000 feet above the surface) were also quite different this year compared to 2007. In summer 2007, temperatures in the Beaufort and Chukchi Seas were 5 degrees Celsius (9 degrees Fahrenheit) above average. This year, temperatures in that region were near average, but north of Greenland and in the Canadian Archipelago, conditions were even warmer than in 2007. These high temperatures likely played a role in the opening of the Northwest Passage. Ocean sea surface temperatures (SSTs), based on National Oceanographic and Atmospheric Administration (NOAA) data provided by Michael Steele and Wendy Ermold of the University of Washington Polar Science Center, indicate above normal temperatures on the surface of the Arctic Ocean. However, the temperatures anomalies were not as extreme as in 2007 and were comparable to those recorded for 2009 and 2010. These lower temperatures may be the result of less solar heating of the exposed ocean surface or less transport of warm waters from the south. In 2007, ice retreated early from the shores of Alaska and Siberia, allowing the ocean mixed layer to heat up and enhance melting of the ice from below. In contrast, ice was slower to retreat in this region in summer 2011, and less bottom melt was observed. Why did ice extent fall to a near record low without the sort of extreme weather conditions seen in 2007? One explanation is that the ice cover is thinner than it used to be; the melt season starts with more first-year ice (ice that formed the previous autumn and winter) and less of the generally thicker multi-year ice (ice that has survived at least one summer season). First- and second-year ice made up 80% of the ice cover in the Arctic Basin in March 2011, compared to 55% on average from 1980 to 2000. Over the past few summers, more first-year ice has survived than in 2007, replenishing the younger multi-year ice categories (2- to 3-year-old ice). This multi-year ice appears to have played a key role in preserving the tongue of ice extending from near the North Pole toward the East Siberian Sea. However, the oldest, thickest ice (five or more years old) has continued to decline, particularly in the Beaufort and Chukchi Seas. Continued loss of the oldest, thickest ice has prevented any significant recovery of the summer minimum extent. In essence, what was once a refuge for older ice has become a graveyard.